One of the main objectives of the QuanTI network is to train the fellows. QuanTI will host and organise three summer schools and three complementary training events, as well as industrial workshops and ad hoc events. All summer schools will run for about two-three days and will be open to external participants. The instructors will include ITN senior researchers, associated partners and visiting scientists. Fellows will have hands-on experience and will be given time to work on their own and in groups, and that will facilitate the interaction of the fellows with senior researchers of the ITN. Mathematical modelling with Markov chains: exploring the dynamics of systems switching between states according to probabilistic rules. Exit times and passage times in Immunology: description of lymphocyte-APC contact and circulation around the body in terms of collisions and escapes of diffusing objects. The immunological synapse: formation of the contact surface between a lymphocyte and an APC, key stage in the initiation of an adaptive immune response. Modelling repertoire dynamics: exploring how the immune system maintains cell populations and regulates their size. Modelling V(D)J recombination: if the number of different types of receptors present on lymphocytes were encoded by individual genes, the entire human genome would have to be devoted to lymphocyte receptors. To establish the necessary level of diversity, T cell receptor genes are instead created by recombining preexisting gene segments. Thymic T cell development: T cell development in the thymus is an extremely stringent process which gives rise to a useful and safe mature T cell repertoire. Thymic stromal cells, which are antigen-presenting cells (APCs), provide a unique environment (or niche) for this process to take place, i.e. thymocytes run the gauntlet in terms of their probability to find selecting ligands in the thymus in a finite time window of opportunity. This winter school was organised and hosted by DKFZ Heidelberg, and took place at the Bioquant Building - a centre dedicated to quantitative biology at the University of Heidelberg. The special focus of this winter school was on the mathematical modelling of molecular regulatory networks in immune cells and bridging the scales from molecular regulation to lymphocyte population dynamics. The school featured lectures, tutorials and hands-on experimental sessions. 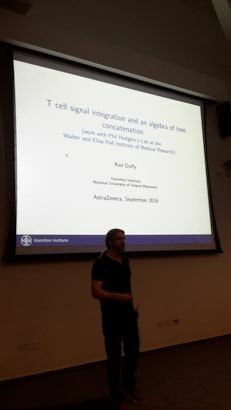 It is directed equally at immunologists and cell biologists, to become acquainted with modern mathematical approaches, and computational/mathematical scientists, to be introduced to topical questions of immunology and medicine. The winter school consisted of longer lectures, focussing on innate immunity and T cell development and differentiation. Lecturers included Hans-Reimer Rodewald (German Cancer Research Center - DKFZ), Max Löhning (Charité and Deutsches Rheumaforschungszentrum Berlin), Marco Binder (University of Heidelberg), Thomas Höfer (German Cancer Research Center - DKFZ), and Frederik Graw (University of Heidelberg). 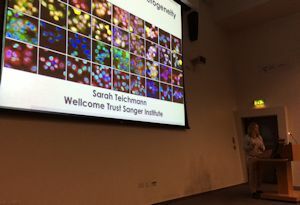 Specific topics included: viral infection, T helper cell differentiation, thymic selection, T cell responses in vivo, and immunodynamics. 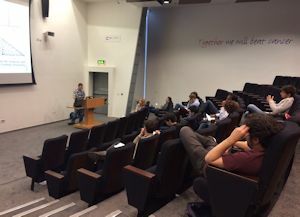 One afternoon was reserved for practical work in groups - there was a practical introduction to flow cytometry for the theoreticians, and a course on theoretical systems biology for the experimentalists. 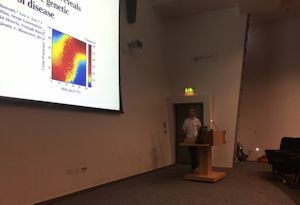 Specific topics included: Labelling techniques in vivo: introducing the students to major experimental advances in our ability to measure human lymphocyte kinetics. Dynamics of viral infections: communicating current understanding of HIV, HTLV-I, EBV and other pathologies such as ageing and leukaemia. Modelling homeostatic T cell responses: providing a quantitative population framework to focus on cell fluxes, residence times, and rates of import, export, proliferation, and death across cell compartments for thymocytes and recent thymic emigrants. T cell population dynamics in youth and age: training in state-of-the-art techniques to understand how ageing alters T cell repertoire maintenance and thymic homeostaysis in children. There was also a hands-on modelling session (using R-studio), where participants were provided with data and models, and were then shown how the parameter estimation procedures can depend on the choice of the model and the statistics of the fitting regime. The fellows also had the opportunity to present posters of their own work. 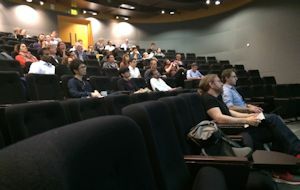 This four-day workshop was organised and hosted by Leeds. 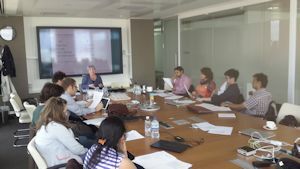 The workshop was devoted to advanced hands-on courses on different key scientific and computational aspects of the ITN research programme, such as courses on Matlab, Python and R. The training also included sessions on generic skills - presentions skills, outreach activities skills etc. These courses were taught by ITN partners (e.g. Matlab) and experts in Leeds on Python, R etc. 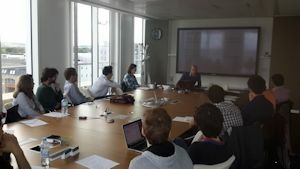 This one-day hands-on workshop was organised by Leeds and hosted by Microsoft Research, Cambridge. 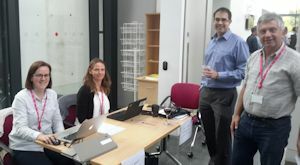 There was a themed session on the Virtual Immune System project and an introduction to stochastic pi-calculus as a modelling tool in Immunology, delivered by Microsoft Research, Cambridge. The second session was on How and Where to Publish by the Staff and Departmental Development Unit (SDDU) based at the University of Leeds. This one-day workshop was organised by the University of Leeds and hosted by Unilever. The first session was given by the Staff and Departmental Development Unit (SDDU) at the University of Leeds, and was on how to write an academic/company CV, help on completing job applications, and how to perform in a job interview. The afternoon session of the workshop was delivered by TalaveraScience and discussed how to begin commercialising scientific results derived from the research programme and how to draw a business plan. A series of focussed industrial workshops on (i) team building and innovation management in industry and (ii) knowledge transfer will comprise part of the core training programme for the ITN recruited researchers. These will take case studies from the industrial partners and/or from the WPs themselves, and examine them in the light of established good working practices in innovation management. This activity will be supported by industrial partners Microsoft, Bayer, AstraZeneca, TalaveraScience and Unilever. It will include training on dealing with IP, project planning, business planning and relationship of research to marketing. 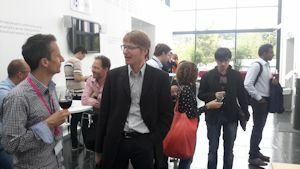 The ESRs and ERs in QuanTI will be asked to organise jointly two such workshops (in year 2 Bayer and year 4 AstraZeneca), where the research results on Systems Immunology and potential industrial applications will be communicated in a clear and accessible way and intellectual property will be considered. To this end, ESRs and ERs will be guided by SRs and industrial partners. The first day of this workshop consisted of talks and activities on how to work in multidisciplinary and multicultural teams, as well as periods of reflection on the day-by-day work in the industry scenario. For the second day, a colleague from Bayer Health Care introduced the Bayer Health Care business and Pharma Industry. This was followed by sessions on mathematics in industry, and a short introduction to pharmacokinetics and pharmacokinetic modelling, which included some exercises. This workshop was hosted by AstraZeneca and held at the Cancer Research UK Cambridge Institute. There were two training sessions for the fellows - one on "Enzymology", and the other on "Innovation and Networking". Presentations can be found in the private section. Seminar on "Bioengineering and the Physiome Project"
Seminar on "T cell repertoires and systems immunology in autoimmune diseases"
Aridaman gave a session on the introduction to the genomics of T cells and to his "RTCR" programme. Seminar on "Early events in dengue and chikungunya virus infection"
Dengue virus (DENV) and Chikungunya virus (CHIKV) are rapidly emerging arthropod-borne viruses that cause a wide range of disease symptoms. In case of dengue, increased disease severity is associated with pre-existing DENV antibodies and high circulating virus titers, which suggests that antibodies directly influence the infectious properties of the virus. I will discuss our recent findings on the early events in DENV and CHIKV infection. We applied live cell imaging and single virus tracking to unravel the route of cell entry and microarray analysis to identify the cellular responses upon infection in the absence and presence of antibodies. For DENV, emphasis will be on the critical determinants in antibody-dependent enhancement (ADE) of infection. For CHIKV, emphasis will be on the route of cell entry, molecular mechanism of membrane fusion, and how neutralizing antibodies interfere with these processes. Antibody-bound DENV particles were observed to enter though a novel phagocytosis-like pathway that is distinct from entry in absence of antibodies. We observed that antibody-bound particles are captured and engulfed by the cell through active formation of actin-induced membrane protrusions. Macrophages actively sense and capture antibody-DENV particles located away from its cell body. The distinct route of entry and trafficking behaviour likely increases the fusion potential of the virus. Indeed, DENV particles internalized via antibodies appear to have a higher chance to induce membrane fusion. The enhanced fusion potential of the virus is a key factor in ADE of infection. CHIKV cell entry is a very rapid process. The vast majority of particles that fuse first co-localize with clathrin. The time from initial co-localization with clathrin till the moment of membrane fusion was on average 1.7 minutes, highlighting the fast nature of the cell entry process of CHIKV. Membrane fusion was predominantly observed from within Rab5-positive endosomes and often occurred within 40 seconds post-delivery to endosomes. CHIKV fusion is strongly promoted by sphingolipid and cholesterol in the target membrane. Potent neutralizing antibodies against the envelope glycoprotein E2 and E1 were found to act at distinct stages of the virus life cycle, e.g. virus cell binding, membrane fusion and viral egress. Antibodies that inhibit membrane fusion were found to block the membrane fusion reaction at distinct steps.